Over Skype, I spoke with Fred Scharmen of the Working Group on Adaptive Systems from his Baltimore studio to discuss his latest “speculative utopian design proposal” for a Nonhuman Autonomous Space Agency offering a “future mode of space exploration and colonization using only robots and cute animals.” Thus far, the project has taken the form of a participatory workshop for architecture students at the Pratt Institute and a gallery exhibition at Pinkcomma in Boston, with another show upcoming in Baltimore. 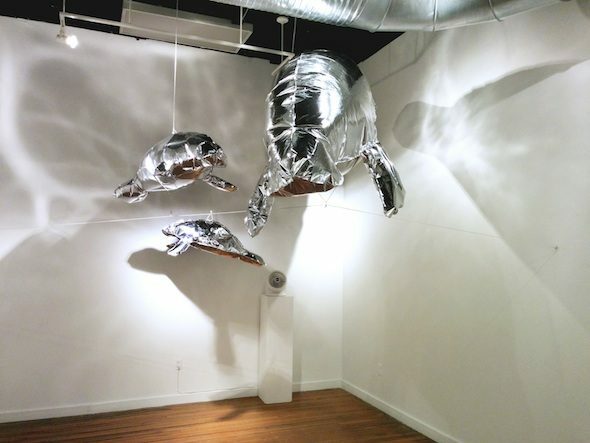 As an exhibition, the Nonhuman Autonomous Space Agency appears in a series of lush renderings depicting “charismatic megafauna” mugging for the eye of a wide-angle webcam, models of bunnies in bubble helmets and a herd of shiny Mylar balloon manatees. 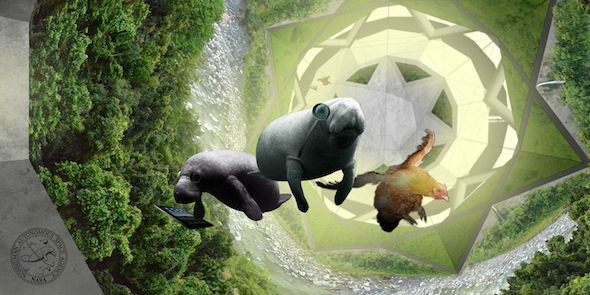 When I got into it with Fred, however, I discovered that the project is in fact an ‘open world’ that anyone with an interest in cute animals, robots and space is welcome to plug into and create their own wild, yet uncannily plausible, scenarios. Alan Smart: Okay Fred, tell me about the Working Group for Adaptive Systems and then about the project. What is this? Fred Scharmen: The name of the firm came from a desire to think about a practice that would change every time a project happened and where there is always a different collection of people and a slightly different approach, encompassing art, placemaking, and urbanism. In the Nonhuman Autonomous Space Agency, what I wanted to do from the start was to make it an “open world”, that is more a recipe than anything. Anyone can create their own scenarios. 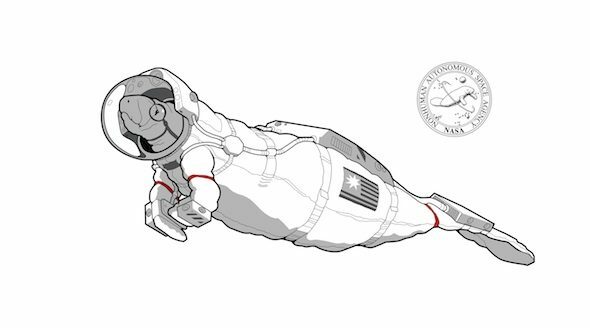 That started with a one-day workshop at Pratt, with the poet Claire Donato, where we asked the students to make, through writing and then with a single image, their own scenarios about non-humans in space. There’s an important me-plus-others aspect of the project. AS: What role does Stan the rabbit have in the practice? FS: My partner Marian and I live with Stan, who is a ‘house rabbit’. I’ve always been interested in learning from domestic animals, to think about what it means to be, like Donna Haraway says, a ‘critter’ — a living consciousness and subjectivity in the world. You contemplate them and in some ways they are completely understandable but still they are just alien in terms of the way that they think about space, and how they communicate. AS: With the Nonhuman Autonomous Space Agency, let’s start with this idea of autonomy. The project has this obvious reference to the space colonies movement in the 1970s that Gerard O’Neill organized. Stewart Brand’s Space Colonies book begins with a cartoon of two American Indians looking up at a space colony. One of them says, “Goodbye, good luck,” while the other says “good riddance” as if this is the white man leaving the earth. There seems to be this idea of reviving the frontier ethos and leaving the problems of earth behind as the energy crisis and the late, weird phase of the Cold War are going on, as well as social and political struggles where you get Gil Scott Heron singing about toughing it out in the ghetto while “whitey’s on the moon.” You did your project as the riots were happening in Baltimore. How is it an update or a response to these older projects from the 1970s and how is it new and different? FS: Yes, in parallel to creating this as a design project, I was doing research on that historical moment when you have NASA, along with countercultural figures like Stewart Brand, both co-sponsoring these studies in which images were created of these huge habitats, miles long, in high Earth orbit. Of course Stewart Brand has always been interested in frontiers, whether it was the back-to-the-land movement or cyberspace as a frontier. Last month I took a trip to Silicon Valley where I visited the NASA Ames Research Center, where the Summer Study on space colonization took place in 1975, and interviewed Rick Guidice, a painter and architect who made some of the images for that study. A couple of things stood out while looking at the history of these images. One is that when NASA started working with Gerard O’Neill, they said right away: “We’re not going to call them ‘space colonies’, we’re going to call them ‘space settlements’.” You can see this in the report Space Settlements, which NASA put out after the study, which shifts the language away from the problematic connotations of colonization. Gerard O’Neill himself writes about how this is a frontier but there’s no one to displace from it. So the idea that this is an ethically clean frontier is present right from the start. In parallel with that, these authors are talking explicitly about how, if we are building new worlds, they are by definition bounded and we can build several of them. They get excited about this consequence: that humanity can self-segregate. In the ‘70s, with the Nixon era backlash against the counterculture, and the ‘culture wars’ heating up into the ‘80s, the idea that you could create your own enclave of only people who wanted to live like you, and not have to worry about encountering anyone who is different, is really immediate and explicitly addressed. This is a selling point; this is one reason why we should go do this right away. The question of autonomy comes to the forefront in these discussions. In architecture, as you know, “autonomy” often relates to this idea that the discipline of architecture only has to answer to its own concerns and that architecture is about architecture and not solving social or political problems. AS: This is also a thing that shows up in the late ‘70s as part of this, yes? FS: Yes, exactly. For me, this idea of the space colony as a closed, bounded object, brings up both senses of the term ‘autonomy.’ You have this form that is closed and you have this idea of a social order that is also closed and complete, it can shut itself off from all sorts of difference. Also, in this conflation, there is the idea of living ‘off the grid’ — very present discourse of the 1970s as well — such that a social order attached to a physical structure, with solar panels, with wind energy, with maybe a farm attached to it, could be totally self-sufficient. The idea of living autonomously gets related both to architecture as a closed system and to the idea the we can create a self-sufficient environment for ourselves really anywhere: the suburbs of San Francisco, the deserts of Arizona, or the L5 point in high earth orbit. AS: Next lets talk about ‘agency.’ As you mentioned, in the original space colonies project, a big part of the production was these super realistic paintings, by Don Davis and Rick Guidice, of the colonies, life inside them, and this weird kind of Arcadian landscape which they imagined creating. In your project now, what are the agencies you see images having, and how do they act in the world? FS: I think what led me to be interested in those images is that, as architects, we make renderings, and often we end up reverse engineering the architecture to create the image. The images are ultimately the commodity that circulates, they have their own independent agency and, whether or not a building gets constructed, they are what generate the economic and political will to do something. 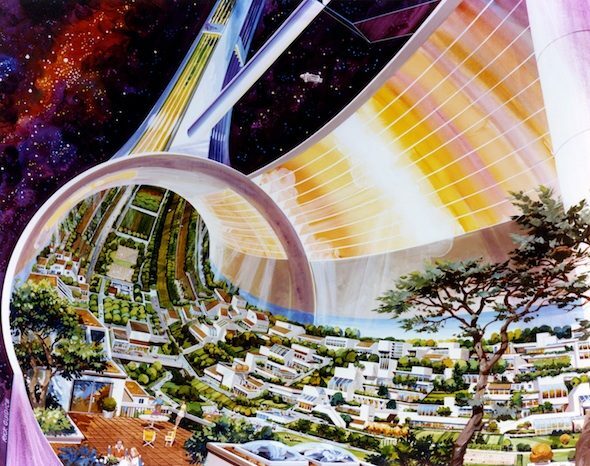 In the space colony paintings, it was these two artists who were hired to sit down and work with the engineers and create these images, which were in the public domain from the start because they were commissioned and paid for by NASA. Then, in the prehistoric phases of internet culture, Al Globus, a contractor at NASA, created an online archive for them because he wanted to keep the project alive. So now they have this viral power, images pop up regularly on blogs and listicles and are able to continue a life of their own. When I spoke to Rick Guidice, I asked him, “What was your conception of the audience for these paintings?” He said, “well it’s the public, but really it’s the public on its way to congress.” So it was really to get public interest mobilized. What I try to bring to this project is a more contemporary virality. It is built into the scenario that no people are allowed to go to space. It is just these cute animals and robots that become the charismatic mascots of space exploration because they are more likeable and more understandable. In 2013, Chris Hadfield, a Canadian astronaut, was the commander of the International Space Station. He was really good at Instagram and social media, and this raised the profile of the ISS in ways that NASA could never have planned or paid for. We can conflate that with cat videos being the other thing people like to watch online, so the ultimate click-bait would then be cute animals in space. AS: This leads into our last question. 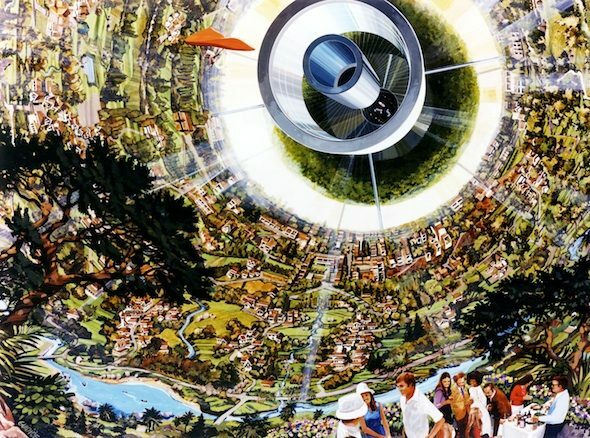 The ‘70s space colonies seem to be about working with the structure of NASA as a big state agency that could do large projects, that spanned industries, didn’t pay off economically right away and involved the kind of collective dreaming we have been talking about. 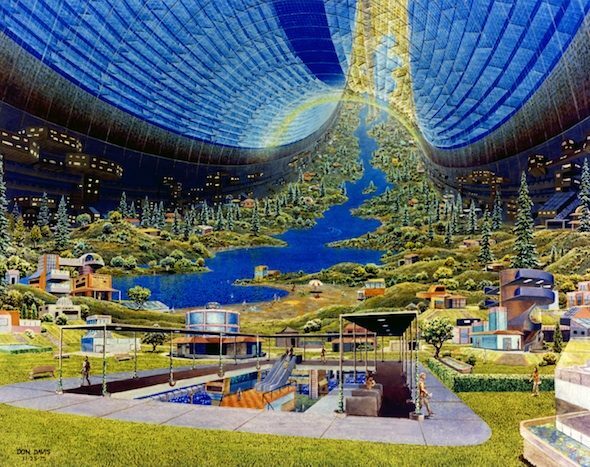 Now, however, even as there is a resurgence of this kind of techno-utopian thinking, it seems like its not so much addressed to “the public on the way to congress” as it is to “the public on the way to venture capital.” You did your research for this project at NASA but where would it go next? Do you plan to pitch this as something that would actually happen in some way and, if so, who would you address it to? FS: Silicon Valley is totally going to be where you go if you want to get funding. You don’t go to congress, you go to Sandhill Road, you go to the venture capitalists. This project keeps finding unexpected resonances there. You can put the images that Bjarke Ingels Group produced for the new Google headquarters side-by-side with those paintings from the ‘70s and say, “here is a reconfigurable, modular building system, under a giant canopy that regulates the internal environment, there is a running track through the middle, there are people doing yoga, and there is a café overlooking it all.” That describes both this painting by Rick Guidice, of the Stanford Torus from 1975 and this rendering from 2015 by Bjarke Ingels Group of Google headquarters, which is literally right next door to the NASA Ames Research Center. I wrote a twitter rant that ended up being picked up by Mark Andreessen, who developed Netscape back in the early ‘90s and now is a successful venture capitalist investing in AirBNB, twitter, skype, and a lot of other startups. I was joking about this historical discontinuity where instead of satellites producing solar power and beaming it down to earth as O’Neill imaged, we have a coal-fired social network that is just churning and rechurning our relationships. We get commodifed social life instead of this other, real social in orbit, that would reify identity and difference in new ways. He was reposting all of this and I said, “Hey Mark, if you like my ideas about space colonization, go fund my cute animals in space startup.” He favorited it but didn’t fund it. AS: Well keep working on this and I’ll look forward to your nonhuman, autonomous, space dome, VIP networking camp and petting zoo at Burning Man in the future. FS: I will put a plug out there: anyone who wants to should play along. It is an open world scenario and it’s more fun if other people come up with scenarios that put cute (or uncute) animals together with robots and charismatic spaceships like the space shuttle to make their own worlds and see what happens. Alan Smart is an architect, researcher, and critic with interests in performance other “non-object” art practices in relation to urban space, and issues of production and reproduction in the city. He has studied architecture at The University of California at Berkeley and at Princeton University and has taught at Syracuse University, Ohio State University, Hong Kong University. He is currently based in Berlin, where he practices independently and as part of the design collective Other Forms working between architecture, graphic design, exhibition practice and publishing.